The Cyviz Technology Center, Washington, D.C., is a 7,000 sq. ft. showcase of visual and collaborative technologies. WASHINGTON, DC--(Marketwire - June 19, 2009) - Think you've seen the highest of definition on the biggest of screens? Some of the most cutting-edge display technologies aren't found in movie theatres, but those used behind closed doors in military and intelligence command centers, where massive walls of ultra-high resolution images and data feeds are seamlessly blended and controlled for joint-warfare training, surveillance, and simulation. Cyviz, the Norwegian company behind these advances, will be opening its fourth worldwide Cyviz Technology Center (CTC), a 7,000 square foot facility showcasing the latest display wall and collaboration technologies in Crystal City, Virginia. The opening of the Center will be preceded by a June 29th VIP-invitation preview, offering a behind the scenes look at the technologies being used by agencies such as NATO, DOE, USAF, NASA, and NIH, as well as Federal System Integrators such as Lockheed Martin and Boeing -- all which require state-of-the-art collaboration and visualization environments. The June 29th media event will feature Norway's ambassador to the U.S., along with 50 executives from partnering companies like Tandberg, Sony, NVIDIA, Crestron, Hewlett Packard, and Bose. Participants will see Cyviz collaboration demos along with the latest in Tandberg video conferencing, the next generation of cinema from Sony, audio from Bose Professional, all powered by HP workstations programmed with Creston's touch panels, and driven by NVIDIA Quadro Plex visual computing systems. "Most of us have experienced an 'a-ha' moment that comes from seeing something in an entirely new way that sparks a realization," observed Cyviz CEO Joar Vaage. "Cyviz is thrilled to be opening a facility where 'seeing is believing,' where you can view and touch how new display technologies can allow all manner of information to be visually presented in the size, detail and resolution that fosters the best of collaborative breakthroughs yielding more powerful decisions," he added. In today's collaborative workspaces, managing and visualizing information in large, ultra-detailed formats are critical for Intelligence analysts, military command and control teams, scientists, and researchers. "NVIDIA has been providing multi-GPU visual computing systems to power large scale visualization walls throughout the world and we're excited that Cyviz has chosen to power its new Technology Center with NVIDIA's flexible, turn-key solutions," said Jeff Brown, general manager, Professional Solutions, NVIDIA. "We look forward to working with Cyviz to increase the visual supercomputing power in all of their centers." -- Cyviz Clusterwall - used in command control centers, news organizations and design facilities, where display walls can be of nearly unlimited size, and projected at the highest resolution in life-size 1:1 scale. Volvo truck designers use Clusterwalls to replicate and stand next to virtual life size trucks as they fine-tune design. A NATO command center uses an 8-meter wide display that combines eight simultaneous data sources, seamlessly projected and controlled through a single computer. -- Cyviz 4K - a solution that features the highest resolution single projector in the world, offering 80+ megapixel resolution for the next generation of cinema. Currently in use at NASA for earth and space research as well as NSA. -- Cyviz Vizwall - a large screen conference room application that blends multiple data and image sources through a single computer controller, in 3D stereoscopic vision. Uses include drug discovery teams viewing 3D models of protein molecules, along with simulation software and video conferencing -- providing a powerful collaboration and decision-making platform for team research. Used at the National Library of Medicine (NLM) for the Visual Human Project and for 3-dimenstional modeling and rendering. -- Cyviz Bizwall - takes group meetings and collaboration in office environments to the next level, allowing a single workstation to manage and display numerous sources simultaneously on super wide, high resolution screens of any dimension. Enables Picture in Picture and stereo 3D viewing. Langley Air Force Base features Bizwalls for executive briefings, collaboration and command analysis. -- Cyviz C1 - a complete 'sight, sound, and seating' environment for enhanced video teleconferencing and collaborative data-sharing. This turn-key solution fully integrates Cyviz, Tandberg and Bose Professional Systems, including rack with processors, the Cyviz display controller, projection, and furniture. 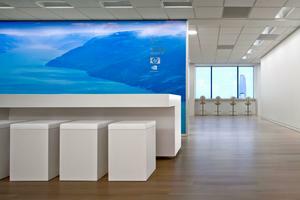 Cyviz is the premium developer and manufacturer of display walls for collaborative environments. With over 10 years of experience, Cyviz has hundreds of installations globally; serving customers in the Defense, Oil & Gas, Manufacturing, and Lifescience industries that seek to improve their information workflow through collaboration for more powerful decision-making. Customers include the Department of Energy, NASA, the United States Air Force, NIH, the NATO Joint Warfare Centre, Lockheed Martin and the Connecticut Center for Advanced Technology. When the highest quality images are required with an unlimited number of sources, Cyviz responds by delivering resolutions of over 40 Megapixels, 80 Megapixels, or more. Multiple channel images can be front or rear projected on literally any size screen through Cyviz's perfection of Edge Blending Technology to make one seamless image all controlled by a single desktop computer. The new Cyviz Technology Center, Washington, D.C., is located at Two Potomac Yard, 2733 Crystal Drive, Suite 800, Arlington, VA. To RSVP to the opening, register online at www.cyviz.com or contact Rachel Nasr, nasr@cyviz.com, 703-416-7090.